Corel has just released VideoStudio Pro X6, the latest generation of its consumer video editing software with impressive advanced capabilities (see previous post on consumer editors). This new version demonstrates how consumer tools can move amazingly quickly to incorporate new technologies -- now with even-higher-def 4K video, motion tracking, and DLSR control. Ultra HD (4K): VideoStudio Pro X6 steps up to the next jump in HD resolution, with resolutions up to 4096 x 2160. You can input, edit, and output from 4K video devices including the GoPro 3 Black, as well as work with high-res DSLR photos -- in both AVC and MPEG-4 formats. HD productions also can take advantage of the new AVCHD 2.0 specification, with AVCHD 3D, AVCHD Progressive, and AVCHD 3D/Progressive 50/60p profiles, for slow motion and action video. You also now can output AVCHD projects to SD card, with menu navigation and chapter points. Motion Tracking: With the new motion tracking technology, you can select objects in the video to track in motion and then attach graphics overlays, for example for a cartoon thought bubble, or security mosaics that hover over features like license plates or faces. Even better, you can save a library of motion paths from tracking to customize and re-use, as well as edit your own paths. Then use these paths to animate still images and titles, or for picture-in-picture effects. DSLR Enlarge: Perhaps the coolest new feature is the DSLR Enlarge mode -- Basically remote control for DSLR cameras (supporting Canon for now). You can hook up your camera and control it directly your Windows laptop (or tablet). The computer displays the camera's viewfinder and brings out the controls, including aperture, shutter speed, and ISO. You get a nice big view and direct control, and without touching or disturbing the camera -- particularly useful for creating stop motion productions. This new version also adds other pro-style technology including variable-speed control within a clip, QuickTime Alpha channels for importing transparent animations, and subtitle editing with voice detection to identify edit points. Meanwhile, the VideoStudio editor has a clean and approachable design, with a Capture - Edit - Share workflow. You can export to files, DVD ot Blu-ray Disc, and mobile devices including smartphones and tablets the web, as well as upload directly to YouTube, Facebook, or other websites. 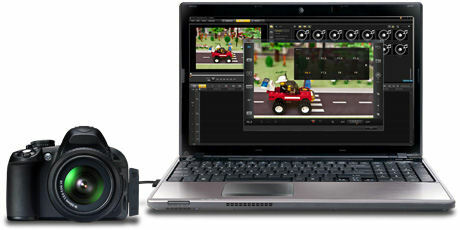 The core Corel VideoStudio Pro X6 product is the full application, with full functionality for $79.99 ($59.99 upgrade). The VideoStudio Ultimate X6 bundle for $99.99 ($79.99 upgrade) then adds plug-ins from Boris Graffiti, NewBlue, and proDAD for animated 2D and 3D titling, color correction, broadcast-quality effects, image effects, video stabilization, and animated pen effects. Check it out for yourself with the fully-functional trial version. Wireless speakers are a fun addition for your portable devices -- smartphones and tablets -- since they let you enjoy and share the music with better clarity than built-in speakers. Smaller wireless speakers provide a nice boost in a portable size (see earlier posts), but still are for individual listing or small spaces. Then the Acoustic Research Portable Wireless Speaker steps this idea up to larger spaces -- in offices, dorms, garages, or for picnicking or tailgating. This is a cylinder of sound, 14 inches high and under 6 inches in diameter. It has a 2 inch tweeter and 3 inch woofer that deliver 5 watts of output -- more than enough to blow out a small space. The speaker has a molded carry handle, with a weather-resistant design for outdoor use, including a rubber cap protecting the power jack and screw-in bolts protecting the battery compartment on the bottom. It plays up to 14 hours from 6 AA batteries. You can play wirelessly over Bluetooth from your device, with a straightforward Pairing button on the top. Or pop open the back to access the built-in 3.5mm audio cable to directly connect your audio player. The back also serves as a storage compartment, to tuck away your music player while it's attached, or to stow your keys or phone. There also are Power and Volume Up/Down controls under the handle. The volume is local to the speaker, independent of the player's volume -- and does beep loudly when you reach the max setting. The Portable Speaker comes in plain white, ready for you to customize with a free skin design from Skinit. Choose from thousands of designs including pro and college sports teams, art, entertainment, or fashion -- or create your own custom design. The AR Portable Wireless Speaker with Skinit is available for $99. It opens up your music from your portable devices to share in larger spaces, and to the outdoors. See my Holiday Gadgets 2012 coverage of Portable Speakers for more on portable audio. Another clever design from TYLT, beyond the fun cables (see earlier post), is the PowerPlant Portable Battery. This is just a bit bigger than mini charger designs -- a rectangle 3 x 1 3/4 x 1 1/4 inches and 5.4 oz -- but still small enough to easily add to your bag. The upsizing adds a real bonus in power -- with 5,200 mAh capacity and 2.1 Amps output, the PowerPlant can provide a rapid charge, or charge two devices simultaneously, bringing two smartphones to full capacity. Plus it goes beyond smartphones to also charge tablets. The design also allows space for two charging ports -- a universal USB port for any USB device, plus a second connector on a flexible arm that pulls out of the side. The USB port is on one end, along with a microUSB port for recharging the PowerPlant, protected behind a rubber cover. The other end has a recessed power button, plus four LEDs to indicate the battery level. The PowerPlant has load detection circuitry to automatically turn on when you plug in a device, and turn off when done. And it still can continue charging devices while it is plugged in to recharge. So if you're traveling, the PowerPlant provides a strong comfort level that you'll have reserve power ready when needed, to refill a phone battery or even to keep a tablet going. And it keeps its charge while waiting -- it's speced to retain a single charge for up to one year. The TYLT PowerPlant Portable Battery is available for around $69 in three versions with different flexible charging arms: microUSB for smartphones, Apple 30-pin for iPhone 4/4S, and Apple Lightning for the iPhone 5 and the like. See my Holiday Gadgets 2012 coverage of Portable Accessories for other useful and fun products. Entries posted to Manifest Tech Blog in March 2013, listed from oldest to newest.